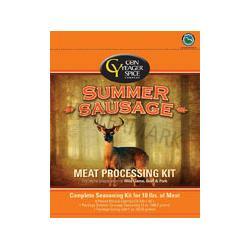 The Summer Sausage Meat Processing Kit is very convenient for the home processor. We like them because they use only the best ingredients and package their products so they are ready for use by the weekend butcher. The Summer Sausage Kit contains Seasoning, Curing Salt and 4 -73mmx20" Fibrous Casings along with detailed instructions using mulitple methods to process 10 lbs. of meat. Made in the USA.